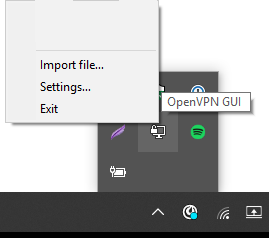 The first thing you need to do to connect to OVPN is to download OpenVPN GUI. OpenVPN's icon should be in the activity tray in the right corner of your screen. You might need to click on the arrow in order to display the icon with the padlock. When you've found the icon, right click on it and choose Import file. Go ahead and right click on the OpenVPN icon again. This time, choose to Connect. 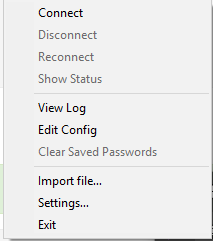 When prompted, enter the username and password you used when creating your OVPN account.